Among traditional Japanese musicians, the typical image of a shinnai performer is a weak and slender man who is sensual and dashing in the Edo style. Tsuruga Wakasanojo XI is different from that and unique. Wakasanojo was born in 1938 in the Kagurazaka area of Tokyo. When he was 10 years old, he started studying shinnai with his father, Tsuruga Isetayu I. The life of an artist in the chaotic post-war time in Japan was not easy. 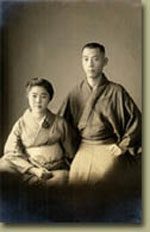 Tsuruga Isetayu’s wife ran a small restaurant in Kagurazaka that provided the livelihood for their family. After Wakasanojo graduated from high school, he sometimes worked in jobs unrelated to music in order to help support the household. During that time, he received lessons from Tsuruga Wakasanojo VIII and Tsuruga Kagahachitayu. From those lessons, he acquired the foundation of his crisp narrative style. 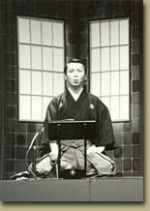 In 1966, Wakasanojo entered the NHK Traditional Music Training School. It was only a one-year academic program, focused on theoretical knowledge of Japanese traditional music, but it broadened his knowledge and understanding of other traditional musical genres besides shinnai. As a result, he became concerned about the decline of shinnai relative to the broad context of Japanese traditional music. This was the, start of his being challenged with respect to the dissemination and continuation of shinnai. In 1971, Tsuruga Isetayu I died. In 1973, Wakasanojo took the name Tsuruga Isetayu II. In 1978, he became the head of a branch of the Tsuruga school of shinnai. He served as a Director of the Shinnai Association, and later was Executive Director and then Vice President of the Board of Directors of the Association. In 1999, he succeeded as the 11th head (iemoto) of the Tsuruga school of shinnai. In 2000, he changed his professional name to Tsuruga Wakasanojo XI. 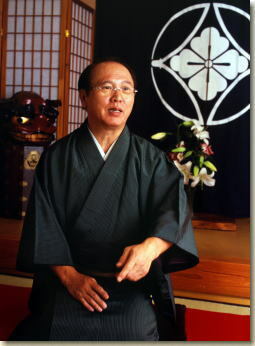 After becoming president of the Shinnai Association, he has made every effort to develop the Association as well as the genre of shinnai. Wakasanojo has performed extensively overseas, with performances in many countries in Asia, North and South America, and Europe. Many of his overseas performances have been done together with the Hachioji Kuruma Ningyo puppet troupe. Wakasanojo’s concept in including the puppeteers is that because, unlike kabuki and dance, shinnai is traditionally performed without any action on stage, the stories are difficult to understand. However, with the addition of the puppets acting out the story, the performances are much more attractive to modern people. 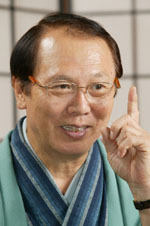 Wakasanojo has composed many works in the shinnai style, including adaptations of well-known fiction, rakugo (traditional comical) tales, and children’s stories. One of his recent works was an adaptation of Chogyou Takayama’s Takiguchi Nyudo, for which he did the production and direction, as well as the musical adaptation. This work was performed as a collaboration of shinnai, Noh, recitation, and puppetry. With innovations like this, Wakasanojo hopes to steadily expand the fan base for shinnai. Wakasanojo has performed in a play with Shigeru Enomoto’s shinnai theatre, and has performed shinnai together with a one-man play. He is always concerned to create and innovate so that shinnai will be attractive to audiences. 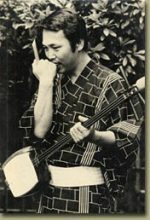 In his younger days, Wakasanojo was called a heretic in the traditional Japanese music world. Unlike the conventional image of shinnai performers, he has a wide circle of acquaintances. The late Kuniko Mukouda, a famous novelist, was interested in his style. Wakasanojo is Honorary Director of the concert hall of the Matto Learning Center in Hakusan city in Ishikawa Prefecture. He supports the revival of rural theaters in Tokushima Prefecture, participates in annual events in Takayama city in Gifu Prefecture, and regularly performs shinnai in many other parts of Japan as well. Wakasanojo’s artistry and efforts on behalf of the shinnai genre have frequently been recognized and evaluated highly. In 2001, he was designated by the Japanese government as a Living National Treasure. In 2005, he performed in the presence of Their Majesties, the Emperor and Empress of Japan. This was the first time that the Imperial Couple had been in attendance at a shinnai performance. In 2009, he was awarded the Order of the Rising Sun medal by the Emperor. That same year, he was designated by the Comissioner for Cultural Affairs as Special Adviser for Cultural Exchange. As part of his duties in that position, he spent more than six weeks performing and conducting workshops in the UK, Ireland, Belgium, and the Netherlands. Wakasanojo has much work ahead of him in order to maintain and develop shinnai. For that reason, he is always concerned to keep his body in good condition. “The art is a person” is one of his mottos.